I could get all into GUA and the performance that we gave, including a piece that fellow composer Nick Hwang and I wrote titled Fishing for Jörmungandr specifically for the conference, but instead I want to talk about an interesting experience Nick and I had this evening in Vienna. Vienna is one of the music capitals of the world, touting the likes of Beethoven, Brahms, Mahler, Schubert, Mozart, Schoenberg, and others. The Hofsburg Orchestra is an ensemble dedicated to performing these works, and consists of many members of the Vienna Opera Orchestra. The orchestra performs at the Redoutensaal, the largest of the theaters in the Hofburg Imperial Palace. The Hofburg Palace belonged to the Habsburgs, the former ruling aristocracy in Austria. Tickets to the event are sold by vendors in Classically-styled jackets outside of the Hofburg Palace. We were assaulted by the vendors, but, because tickets were expensive, declined. Later near the St. Stephen cathedral, we were approached by more vendors for tickets. One man offered us a student discount. Another offered us a free ticket with two free bottles of champagne and very good seats. We took the latter offer. 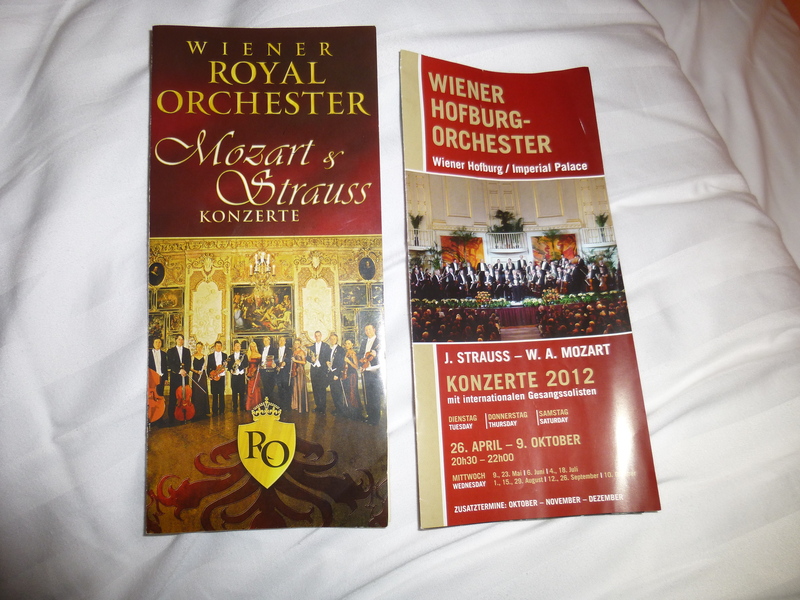 We arrived at the Hofburg palace only to realize that our tickets were for a different concert at another building in Vienna. We arrived to fold-out chairs and a much smaller theater than we thought. Also we unfortunately discovered, this “orchestra” consisted of five strings, a flute, clarinet, and timpanist. A piano player fleshed out the other orchestral parts. They played the “greatest hits” of Mozart and Strauss. So both flyers were crimson red. One was titled “Strauss and Mozart.” The other was titled “Mozart and Strauss.” Both were happening at the same time in Vienna. Now, I am going to stop short of calling it a scam, because the performers were adequate, and sometimes even good, but we sure felt ripped off. Tickets were definitely not cheap. At one point, the Austrian violinist even addressed the crowd in English. Why do that unless you are targeting tourists? Imagine if the Louisiana Sinfonietta changed their name to the Baton Rouge Sinfonietta and scheduled all of their concerts opposite of the Baton Rouge Symphony Orchestra, then hired people to stand outside the River Center where the BRSO plays and sell tickets for their concert which was to happen at the same time. In no way am I saying that one orchestra is better than the other, but as far as audience size and community support, the BRSO has a clear advantage. At any rate, it seems a little dirty to me… Or maybe it is just guerrilla advertising. Nick mentioned to me how funny it would be if we arrived, and the concert was actually a covert attempt by composers to gather an audience for modern music. I was secretly hoping that to be the case. I wonder why one offends me and the other does not. We didn’t buy any tickets in front of either place. I suppose it was because when we were in the Hapsburg plaza there was a big win storm and one of the signs came within inches of hitting me, then I tripped over some speed bump and a janitor did plow into me. I told my gang, I had to read the signs and get out of there until I didn’t make it out. Then I suppose in front of St. Stephan’s Cathedral we were too busy looking up and looking for the Giant’s gateway entrance to our final judgement to notice anyone talking to us. Yes, Vienna is definitely a fascinating place! I pray you are having an amazing trip! I think you are just smarter than me. If I had read the signs, I wouldn’t have bought the tickets either. Afterward, we even mused about all the red flags that should have alerted us, but didn’t. I think the whole thing is interesting (except Wendy’s tripping into the janitor) To think you’d be listening to anyone in a foreign country even by deceit is kind of neat unless you were expensively deceived.